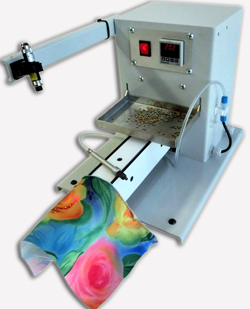 The Vakufix handheld hot fix setting machine by Nagel & Hermann allows the user to manually adhere rhinestones, rhinestuds, nailheads, half pearls or any other rounded hot fix element to textiles. This small machine has a built-in heating element that can be set to your desired temperature. By controlling the temperature, the designer has the ability to embellish a full range of textiles – from mesh type materials to heavier costuming fabric. The small footprint of the machine is a great fit for virtually anywhere in your workspace and travels quite easily. The footprint measures approximately 24 inches long and 12 inches wide – at about 14 inches tall – and weighs approximately 30 lbs. The machine is built with a robust metal frame incorporating all the operational parts and the electrical system on or inside the frame. All components are built to industrial grade quality and are built to last for years. The Vakufix can accomodate elements from size SS6 up to SS36 by utilizing the interchangeable solid steel nozzles. The setting nozzle can be changed by just unscrewing and replacing the nozzle with one of the 4 different sizes – there is no need to change the entire setting pen. 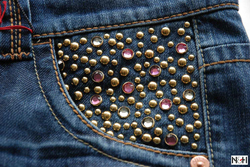 In addition, the machine offers a cross laser to aid in positioning of the stones on to the fabric. This laser can be mounted on either side of the frame (depending if you are right or left handed) and can be adjusted over the heating element to your desire. Lastly, the removable tray will hold the elements that are being used and can easily be emptied and refilled. If you would like more information on the Vakufix, please call us at 1-877-724-6400 or fill out our contact form here. We would be happy to answer any questions you may have! Please watch the video below to see the Vakufix in Action!